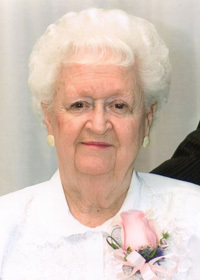 Jacolyne Colleen (Bradley) Anderson, age 94, passed away peacefully surrounded by her family on Monday, June 4, 2018. Jackie was born August 25, 1923, in Des Moines, Iowa, to Victor Otho Bradley and Myrtle (Williams) Bradley. She married Leo Francis Anderson. She loved her family and took pride in her role as a homemaker. Jackie was a member of Simpson United Methodist Church. She enjoyed camping, shopping and searching out treasures at flea markets, and dining out, but above all else, she loved her family and cherished time spent with them. She is survived by her children, Vicki (Gary) Stroud, Lynette (Larry) Smith, Nancy (Richard) Kalina, Steven (Renee) Anderson, and Kurt Anderson; son-in-law, Tom Clark; 14 grandchildren; 22 great-grandchildren; and other loving family and friends. Jackie was preceded in death by her husband, Leo Anderson; daughter, Susan Clark; parents, Victor and Myrtle Bradley; and sister, Marilyn Bradley. Visitation will take place from 5:00 to 8:00 p.m., Thursday, June 7, 2018 at Hamilton’s Funeral Home, 605 Lyon Street, Des Moines. Funeral service will begin at 11:00 a.m., Friday, June 8, 2018, also at Hamilton’s, and will conclude with burial at Laurel Hill Cemetery. Reception to follow at Simpson United Methodist Church. In lieu of flowers, contributions may be directed to Simpson United Methodist Church, 2600 Capitol Ave, Des Moines, IA 50317.